For two years, Nancy Lublin was CEO of two companies, working two full-time jobs. This past November, she downsized to one full-time job — working as the CEO and Founder of Crisis Text Line , which supports thousands through suicidal thoughts, sexual abuse, drug addiction, and more via Twilio SMS. Now that Nancy is only working one job, she’s focused on putting herself out of business. “The goal of every not-for-profit should be to put themselves out of business,” says Nancy. “I’d be very happy if there were no more pain out there. That’d be great.” She speaks as both an unflinching optimist and a hardened realist who’s been in the nonprofit sector for more than a decade. Nancy is aware of Crisis Text Line’s Herculean task to support someone through a moment of crisis and provide those policy makers with data that informs new laws which address the root of crisis. It’s an uphill battle Crisis Text Line is taking one text at a time. So far, they’re at nearly 20 million texts. Traditional businesses measure user response times by the order of hours or days. Crisis Text Line has a different scope of time. They measure response time in minutes and seconds. 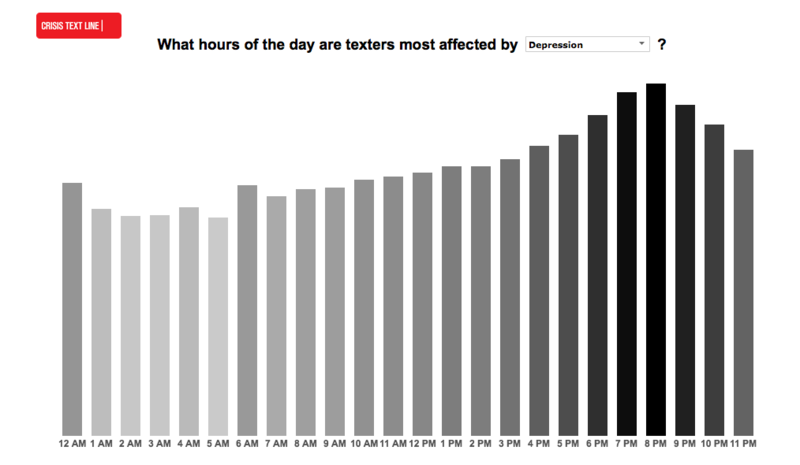 “Our texters mention ‘today’ 6x as often as any other time. That means they are getting crisis help in the moment, when we can help them make a smart decision,” says Nancy. During our interview, Nancy whips out her phone, opens Slack and shows me a Slack channel containing her team’s key performance indicators (KPIs) autogenerated by StaffHat. Nancy uses Crisis Text Line’s quantitative data to inform critical qualitative measurements. On the day of our interview, 283 counselors manned the phone lines, averaging 40-60 messages per conversation. 83% of those counselors logged a sub-5 minute response rate. Nancy is pleased. She adds a caveat that Crisis Text Line shoots for a sub-1.4 minute response time for “code orange” instances. These are people who are at high risk of self-harm. “You’re either about to have a panic attack, or about to ingest a pill, or about to relapse on something. Or, we remind you how strong you are, what your coping skills are, and you make a healthy decision for yourself,” says Nancy. While Crisis Text Line conversations are inherently reactionary — a user prompts a Crisis Counselors’ response with a text — Crisis Text Line as a whole is working to be more proactive, to address crisis before it makes it all the way to a text. Crisis Text Line uses their records to recall safety planning for users, and aggregates anonymized data on crisistrends.org to inform policy makers. Using this data, they can provide better support to their users. – Nan Krafft, Head of Supervision Product at Crisis Text Line. Counselors use a therapeutic technique called mirroring to foster a sense of trust with the texter and allow them to discover their own coping strengths. Each conversation that takes place on Crisis Text Line is a tiny data point. When Crisis Text Line looks at a record of their conversations, and places hundreds of thousands of data points on a map, a picture comes into focus. 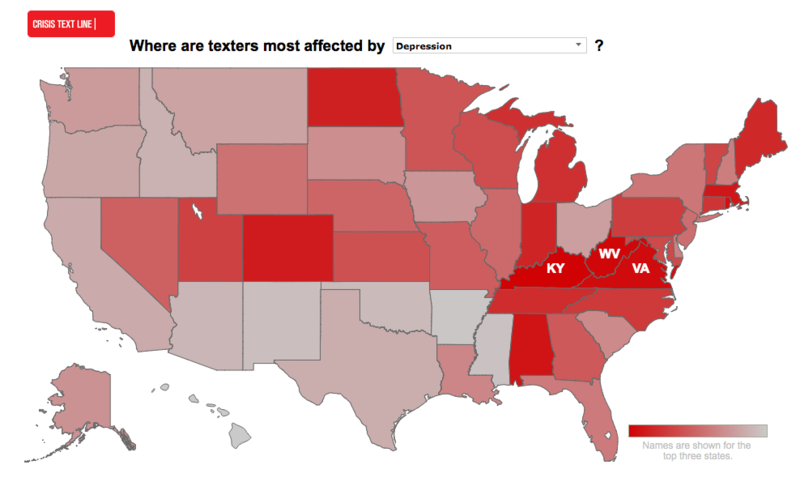 They can see which states have higher rates of substance abuse, hotspots where teens suffer from anxiety, counties where texters frequently report physical abuse. Crisis Text Line anonymizes the data to protect the privacy of the user and can be seen at crisistrends.org. There’s another step they take to help their users — sharing the aggregate data with policy makers. Crisis Text Line is part tech company and part nonprofit. Their nonprofit side drives them to influence policy. Their tech side wants policy to move faster. “If the data shows there’s an acute problem in some part of the country for substance abuse, put more drug clinics there, put more programs there. We are like a heat map so we hope that leads to smarter policy, smarter funding, changes in schools and police departments,” says Nancy. Nan chimes in to make an important distinction between two types of conversation. As the conversations between texter and counselor dwindle, the national conversation on crisis prevention should increase. They’re inextricably, and inversely, related. “Part of what we consider a lot is how do we raise the level of the conversation? The fact that we’re at what someone might call a tech conference in San Francisco and there’s a conversation about mental health is because of us using this technology. We want this conversation to be a conversation that takes place all over, about mental health but also about technology and non profit and using technology in a way that’s for good. Good work doesn’t have to be non-profit.” Nan concludes. There’s a pause, a rare pause in our conversation. Nancy, holding her phone in her hands, looks like she wants to reopen Slack to check on Crisis Text Line’s performance again. Crisis Text Line’s battle is won text by text, moment by moment and they can’t afford to waste either. While each data point, each spot on a map, each region represents a conversation. The staff at Crisis Text Line know that the conversation represents, and is comprised, of something that isn’t as easily quantified – a person in crisis. Apps, APIs, and data visualizations can either abstract that fact or put it into focus. With nearly 20 million texts in tow, Crisis Text Line’s data is putting crisis into focus for the community they serve, themselves, and the nation.